Two 15-year-old boys have been arrested amid reports a pupil was cut with a meat cleaver during a brawl. The victim, who was also 15, suffered cuts to his leg during a fight in Burnley Lane, Chadderton, Oldham. A video of the alleged attack on Thursday was shared on social media. It apparently shows pupils fighting. Two teenagers have been arrested on suspicion of affray, attempted assault and possession of a bladed article, police said. 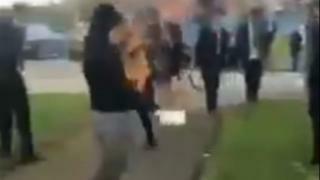 The viral footage apparently shows one boy, dressed in grey jogging pants and a dark hooded top, swinging a meat cleaver around and apparently making contact with another pupil. Greater Manchester Police said it was aware of a video circulating on social media purporting to be of the attack. It is appealing for witnesses to come forward.